Richard Nossiter was, like his father John, a carpenter. He married Elizabeth Lodge at St John's church, Yeovil, in 1800. Elizabeth Lodge was born in 1777 at Bath. Richard and Elizabeth had at least four children, all born and baptised in Yeovil; Mary (b 1802), Richard (b 1803), Charles (b 1804) and John (b 1805). Charles Nossiter was born in Yeovil in 1804 and was baptised at St John's church on 1 January 1805. Much of his early life is a mystery but from later records it is known that he worked as a glover and as a labourer. Nevertheless Charles had brushes with the law; the first time he was convicted he was sentenced to three months in gaol for stealing an iron bar. Charles's brother Richard married a Maria Ross and it is possible that Charles' friend John Ross, a stonemason, was her brother and therefore Charles' brother-in-law. In any event Charles and John jointly stole a quantity of silk; they were caught, charged, tried and found guilty - both received a twelve-month sentence. 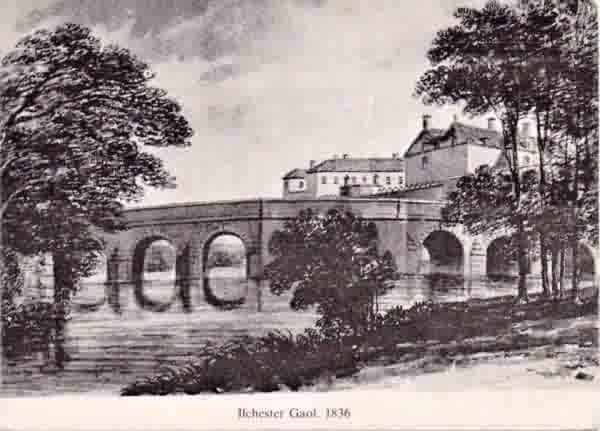 On 27 November 1828 both Charles and John were committed to Ilchester Gaol (see Gallery) by J Newman Esq on charges of stealing a box containing two pounds in silver, an insurance policy, and other papers, the property of Henry Barrett. Both were tried at the Epiphany Sessions at Wells on Monday 12 January 1829, found guilty, and sentenced to transportation for life. At this time Charles was aged just 25, John Ross was a couple of years older. They were both then conveyed to HMS Captivity, a prison hulk at Devonport, Plymouth, Devon. These so called hulks just about retained their ability to float and were typically situated in harbours. This then made them convenient temporary holding and secure quarters for the convicts who were awaiting transportation to Australia and other penal colonies within the British Empire. 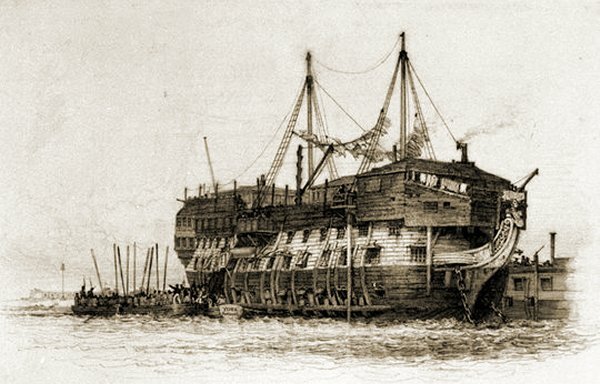 HMS Captivity, the second hulk of that name, was a former 74-gun Third-Rate 'Arrogant' class ship of the line launched in 1786 as HMS Bellerophon (a veteran of the Battle of Trafalgar and the ship which brought the emperor Napoleon as a prisoner to England). She became a prison hulk in 1815 and was renamed HMS Captivity in 1824. The record shows Charles' behaviour during his time on board HMS Captivity was 'Good'. Charles and John were later transferred to the convict transport ship HMS York, which left England for Australia on 11 May 1829. After a journey of 109 days, HMS York arrived at Hobarton, Van Diemen's Land (today's Tasmania) on the 28 August 1829 with all 192 convicts surviving the voyage. On arrival in Van Diemen's Land, Charles gained a position as Wardsman at the Colonial Hospital in Hobart (founded in 1804 as a penal colony) but, according to his conduct record illustrated below, was very soon in trouble again. On 18 January 1830 he was charged with "Conveying liquor into the hospital and assaulting a hospital constable". He was found guilty and sentenced to fifty lashes. He was found guilty of neglect of duty and disobedience on 4 April 1832 and again sentenced to fifty lashes. Drink was again his downfall and on 18 July 1832, he was found guilty of being drunk, neglect of duty and insolence. He was sentenced to 14 days on the treadwheel. 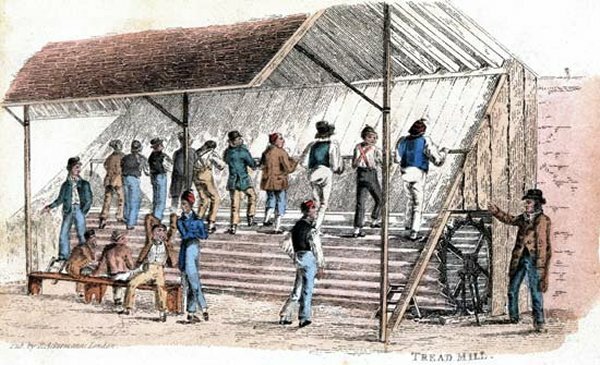 The treadwheel, also known as treadmill or 'everlasting staircase', was a penal appliance introduced in 1818 by the British Engineer Sir William Cubitt as a means of usefully employing convicts. The device was a wide hollow cylinder, usually composed of wooden steps built around a cylindrical iron frame, and was designed in some cases to handle as many as 40 convicts. As the device began to rotate, each prisoner was forced to continue stepping along the series of planks. The power generated by the treadwheel was commonly used to grind corn and pump water, although some served no purpose at all other than punishment. On 9 August 1834, having gained the position of Post Office Messenger, he was found guilty of being "absent out of hours' and reprimanded. However on 14 October 1834, while still employed as a Post Office Messenger, Charles was found guilty of embezzling the sum of one pound, the property of Jorgen Jorgenson and being neither his servant or his agent, appropriating same to his own use. The penalty this time, however, was twelve months hard labour on the roads with the Spring Hill Road Party. With only days of his sentence to go, on 30 September 1835, Charles absconded but was apprehended the following day. As a consequence he received a further sentence of nine months hard labour (in chains) on the Bridgewater Causeway. Six months later, on 14 March 1836, he was found guilty of "neglect of duty and insolence" and sentenced to confinement in the cell at Bridgewater for 24 hours on bread and water. On 13 July 1836, he was found to be "Absent from his gang" and sentenced to 24 lashes. Then on 20 September 1836, for neglect of duty and being drunk, he was sentenced to the treadwheel "for the next six Saturday afternoons". On 7 January 1837 he was found to be drunk, but escaped with a just a reprimand. On 3 September 1838 and now on a Ticket of Leave, Charles had a welcome change of luck and on a charge of destruction of property was discharged. (A ticket of leave was a document of parole issued to convicts who had shown they could now be trusted with some freedoms.) However on 4 May 1839 a charge of misconduct earned him six months hard labour on the roads and the suspension of his ticket of leave, which was restored on 29 October 1839. On 5 December 1839 Charles was charged with "Misconduct in being on Mr Kramer's premises, and insolence before the Police Magistrate" brought a further three months hard labour on the roads, then to reside in the interior as well as 36 lashes. Four months later, on 6 April 1840, for being in a public house after hours his ticket of leave was again suspended and Charles was sentenced to hard labour on the roads for another three months with the New Norfolk Bridge Party. This bridge was the first built across the Derwent river and the sandstone approach footings are still in place on the south bank today. With his ticket of leave restored, Charles was found guilty on 20 July 1840 of being in town contrary to orders and got hard labour on the treadwheel for a month. Clearly not one to learn from his mistakes, a repeat of this offence on 3 February 1841 saw his ticket of leave suspended once again and a further six months hard labour with the New Norfolk Bridge Party, then to reside in the Campbelltown district. As usual the restoration of his ticket of leave was of little value to Charles, and the following is indicative of the standard of justice at that time: 28 December 1841, "Being suspected of a felony" he was ordered to remove to the central highlands district of Bothwell, and "The Lt Governor has been pleased to direct that this man's ticket of leave be cancelled." On 11 April 1840 Charles was admitted to the Colonial Hospital as an 'object of charitie'. Although no details of his illness have been found he clearly recuperated quickly as just a week later, on 18 April 1842, he received another four months hard labour on the roads for being drunk. Seemingly undeterred, he was found guilty of misconduct on 30 April 1842 and received three days solitary confinement. A further four days solitary confinement was imposed on 27 June 1842 and misconduct brought a further four days of solitary. Plus, on the same day and on a second charge of misconduct, he received a sentence of 14 days hard labour to commence at the expiry of his previous sentence. On July 1842 he was brought up on charges of misconduct yet again but on this occasion was simply reprimanded. On 19 January 1843 a charge of insolence resulted in seven days solitary confinement, but Charles but a further charge of insolence got his three months hard labour. He then appeared, yet again, on 21 August 1843 on a charge of gross insolence with the inevitable result of a further twelve months hard labour on the roads. Finally, with his ticket of leave restored yet again, Charles managed to avoid the courts until 27 May 1847 when, on a charge of being drunk and using abusive language, he was fined ten shillings. It must be said that, while Charles was clearly a thorn in the side of authority and obviously enjoyed a drink or several, having read through several accounts of fellow prisoners, his story is far from unique and it would appear that the slightest misdemeanor would result in the harshest of penalties as a matter of course. In the meantime Charles married Tasmanian-born Elizabeth Margaret Williams, known as Margaret, on 2 March 1846 at St Thomas' church, Brown's River, Kingston, Tasmania. She was the daughter of Thomas Williams, a former convict and his wife Anne née Chaffey, and at the time of marriage she was aged 22 while Charles was 42. Charles used the surname Nosworthy at his wedding and his given age was 30. The real Nosworthy was a free man who arrived on HMS York with Charles, but in 1835 he and four others were involved in an armed robbery and sentenced to death. Nosworthy's sentence was later commuted to life and he was released in 1857. It is difficult to imagine Charles's feelings when on 21 September 1847, having been recommended for a Conditional Pardon, it was finally granted that day, after 19 years of incarceration. With a rapidly growing family he was granted 10 acres of land at Long Bay, (now Middleton) in 1854. The land is steep and would have been heavily timbered and many hours of sweat and toil would have been needed to recoup even the most meagre standard of living for his family. No evidence of any dwelling remains today, and nobody today can remember any ever being there. Charles and Margaret's family grew to at least nine children; Thomas Charles (1848-1883), Samuel (1850-1877), Margaret (1852-1874), Nancy (b 1854), Elizabeth (1861-1945), Charlotte (1862-1921), Sarah (1863-1948), Susan (b 1863) and George (b 1864). 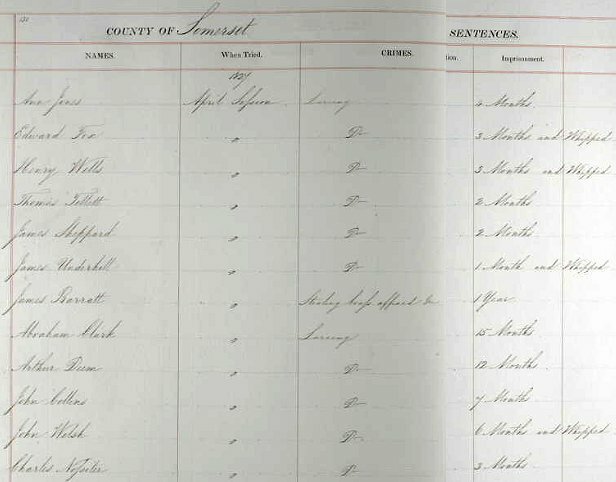 In the late 1860's, after Charles had served three months for deserting his family, he is recorded on the Electoral Roll as renting a house from an adjoining land holder. As his family had never reunited after his gaol term, it is possible he had sold the property to the neighbour, and then rented it or some other dwelling from him. Some justification for Charles having left his family may be obtained from the fact that his wife was mentally ill, (although it is not clear whether she only became this way because of him leaving). His eldest daughter, Margaret, was also variously described as an imbecile or idiot in the manner of the day, and this after his years of suffering may have been the final straw, although perhaps it should be remembered that at the time of his sentencing, both he and his friend Ross were described as "both being bad characters who had been in trouble before". After the family break-up, his wife Margaret and the children spent many years in various institutions with the children being found at times begging in the street. Most of the girls gave birth whilst in their teens and unmarried, and those children in turn, had more than their share of poverty, courts and institutions. The family reverted to the Nossiter surname about 1866. Charles was bound by his Conditional Pardon not to leave the state but he spent his final days at the Brickfields Invalid Depot, North Hobart, Tasmania, where he died on 7 November 1866, age 61, of Phthisis or pulmonary pneumonia. The record of his death, shown below, notes that he was a pauper at the time of his death and was known as 'Charles Nossiter or Nosworthy'. The small lane leading to this area and the adjoining property is Sunnybanks Lane and, when looked at today, it seems that no more than half of the property was ever cleared, it is fairly steep and is unlikely to have been useful for other than grazing. Many thanks to Graeme Nossiter of Tasmania, Australia, for most of the above information. 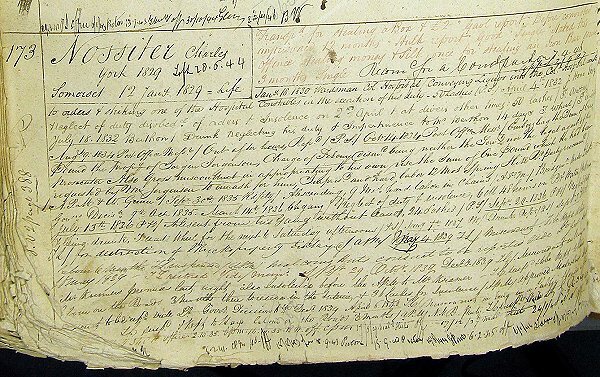 A page from the April 1827 Somerset Quarter Sessions (I've combined two pages to fit in the space) showing Charles Nossiter's sentence of three months for larceny. Charles' is the last entry shown here. A prison hulk, similar to how HMS Bellerophon would have appeared when renamed as HMS Captivity. This 1829 drawing by Edward William Cooke depicts the former 74-gun HMS York, moored in Portsmouth Harbour. Charles Nossiter, together with his friend or brother-in-law John Ross, both convicted at the January 1829 Somerset Quarter Sessions and sentenced to transportation for life. 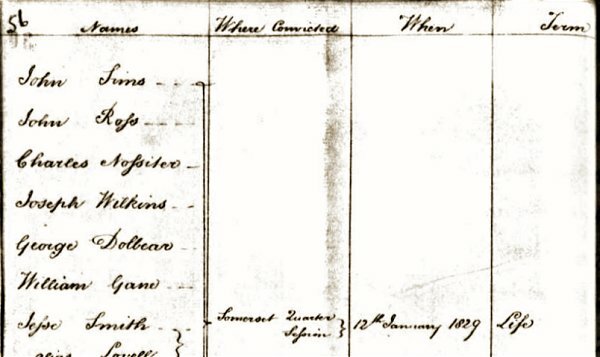 Charles Nossiter's entry in the Tasmanian Appropriation Register, showing him to be 25 years of age, a glover and labourer from Yeovil, sentenced to transportation for life. Charles Nossiter's criminal career in Tasmania, detailed in the Tasmanian record book of prisoner's behaviour, most of which is described above. The record of Charles' death at Brickfields Invalid Depot, North Hobart, Tasmania.